Note: Only the spoken word counts. We have approvingly received the news of the resolution of the City of the Hague to put itself on the map as a ‘World City on the Sea’ (see: Structuurvisie Den Haag 2020). In this plan, the cultural sector plays an important role, but as far as we are concerned, this role is not important enough. The indecisive manner in which the Hague is playing the creativity card has caused us some concern. Ladies and gentlemen, from our position as National Advisers, we can tell you that this aspect of creativity is in dire need of a new start. If the Hague fails in this respect, it might just as well put away its dream of operating as a world city. Indeed, Amsterdam, Rotterdam, Utrecht – not to mention all the cities of the caliber with which the Hague wants to compete such as London, Dublin, Berlin, Brussels and Paris – are much more active in this regard. These cities do not hesitate to tap their creative capital in order to reinforce their future as world cities. The Hague cannot and must not leave behind. In the light of this urgently needed new beginning, we call upon the collective cultural elite of the Hague not to sit passively by and wait. It is embarressing, yet understandable, that city authorities are immobilized in their endless search for how, where and when its new start as a world city is going to be achieved. We believe that only the cultural sector can provide the lifeblood needed to achieve the high ambition of the Hague city government. It is now up to the cultural sector to take the initiative! 1) We must no longer speak of culture, but of creative capital. It is clear that only in its initial inspiration, creative activity is still about the traditional art trade. The decisive factor is the breaking through of the relative slowness and the elitist character of this process. To do this, we need to be aware that all individual creativity is capable of generating immense added value for society. We want to emphasize this aspect of potentiality: creative activity only offers added value if it has the right focus and is backed up by the necessary investments and expertise. Creativity is a form of human capital that must not be left untapped. 2) What is good for the creative class is good for all of us. – A creative climate sharpens a city’s (inter)national competitive position. A world city has to possess more than just a number of successful industrial parks. To succeed, a city also has to excel in unconventional living environments. The decisive factor is a productive climate that provides space for the individual creative entrepreneur. – Creativity also contributes to the construction of a local economy and consequently helps a city to avoid fluctuations in the global market. The small-scale activities of creative entrepreneurs bring neighbourhoods to life, bring different population groups together, generate involvement and have a contagious effect on previously passive citizens. 3) Maximize the potential of creative locations by connecting them with other networks and sectors. The creative industry is not a strictly defined, autonomous sector, but a totally integrated part of daily life. As a result, creative work cannot be grasped in terms of traditional production relationships. As is true in everyday life, creative labour only generates its added value in synergy with other sectors. It is therefore necessary to integrate creative activity in an open network in which sectors freely and unrestrictedly associate and disassociate with one another. The free market model is the leading example here. 4) Uncertainty is the source of all creativity. As mentioned previously, creative labour is diametrically opposed to traditional production relationships. The experimental organization of the creative sector forces us to change our thinking about the security of our means of existence. Creative labour is impossible to quantify according to the usual procedures. And we should not want to do this. Like no other, the creative spirit knows that certainty means the death-knell for all inspiration. The task for the World City of the Hague is the construction of creative production environments that provide space for flexibility, uncertainty, change and dynamism. 5) Do not give up on your idealism. Ensure a profound connection between life and work. The unique added value of creative labour lies in its unabated idealism. The creative sector is one of the last social groups that does not work for financial renumeration, but rather because of an inborn need for self-expression. Creativity is not simply a symbolic statute or learned expertise that is independent of and separate from the ordinary personal identity. Most creative ideas are developped not ‘at work’, but during leisure time, through accidental social contacts, in conversations with one’s partner, or even while caring for one’s children behind which. Better than anyone, the creative class understands that creativity is not about ‘less work and more life’, but ‘more work and more life’. 6) The marketplace needs you. Grab the opportunities! It is not only city management that desperately needs the creative industry. So does the market. Our ordinary economy cannot generate real creativity. The latter requires too much advance investments, too long a period of development, and it offers uncertain returns in the short term. The flexible, non-commodified and spontaneous labour conditions inherent to the creative sector are the ideal breeding ground for creative capital. Top companies are more than happy to take advantage of this. For the creative sector, this interest on the part of top companies offers exceptional opportunities. Indeed, the development of creative ideas requires an appropriate framework. Interested top companies can here lend a helping hand. In addition to the sorely needed injection of capital, knowledge is needed to successfully put the creative product on the market. 7) Do not hesitate! The world city of the Hague counts on you! As national advisors nobody knows better than us that the creative sector is made up of anything but a slavish, obedient workforce. The creative spirit follows neither norm nor command – and rightly so! And do keep in mind that with this speech, we make no demands, let alone expect obedience. Our advice to creative individuals is to do exactly what you like to do the most. 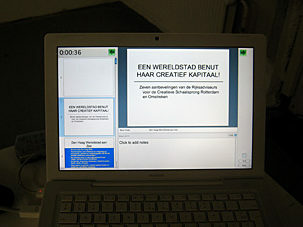 Creative individuals in the Hague should no longer be embarrassed about satisfying their profound creative desires. With regards to the latter, The Hague offers them every opportunity. Also top companies no longer watch from the sidelines but are eager to engage themselves. In conclusion, today, the Hague has a dream, a dream of being recognized nationally and internationally as a world city. This dream will not prove to be just an idle hope on the condition that the market and the government are able to engage the creative sector in this project. In this new context, the creative class of the Hague has nothing to lose, except its existence as powerless artists locked away in their studios. We are convinced that all the parties involved, including the creative sector, will accept their responsibility for the sake of conquering the honourable title of world city. Whatever the future may bring, from our position as national advisors, we will be closely following the developments.